Dinosaur dig excavation skeleton kits. Students can conduct their own paleontology excavation dig right in the classroom! 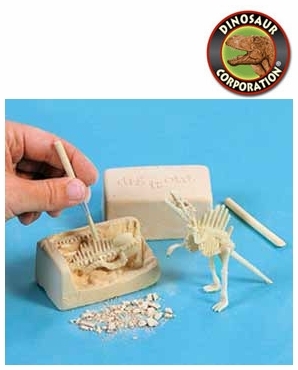 Each kit includes a poly resin dinosaur embedded in gypsum sand, plus a brush and stick. Dino dig excavation kits are T-rex, Deinonychus, Seismosaurus, Spinosaurus, Triceratops and Stegosaurus.